Studio NYC is a transitional contemporary brand geared toward cutting edge, chic design trends. Its premiere collection, Organic Modern, features fascinating digitized aesthetics conveyed through an organic filter. Simple geometric patterns are viewed as if through a lens or telescope, imbued with life from the classic earthen elements of water, land, and flora. The Fabric House is so much more than just a fabric store in Nashville, TN, and Louisville, KY. What sets us apart from other stores and websites is our customer services. 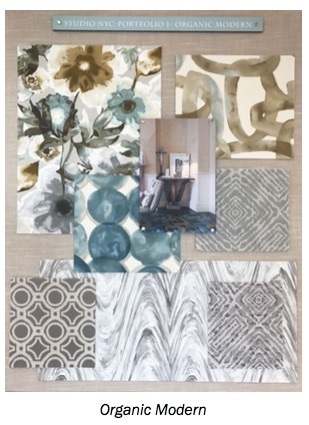 Whether you’re creating a pillow or decorating your entire home, our design consultants are happy to assist you with your project. If you would like custom draperies, bedding, or pillows made from our fabrics, we will design them and have our workrooms make them. Since 1966, we have had the region’s best and largest selection of decorator fabrics and trims. All are first quality and are sold at discounted prices. The prices are low everyday to everyone, so you don’t have to wait for a sale. You will also find a great selection of in-stock drapery hardware.